John Francis Kinney was born June 11, 1937, Oelwein, Iowa. He is the son of the late John and Marie Kinney. Bishop Kinney was ordained to the priesthood on February 2, 1963, at the Cathedral of St. Paul by Archbishop Leo Binz, following studies at Saint Paul Seminary, St. Paul, Minnesota. Bishop Kinney holds a Bachelors of Arts from Saint Paul Seminary; and a Doctorate in Canon Law from the Lateran University, Rome. In 1963, Bishop Kinney was appointed Assistant Pastor of St. Thomas Parish, Minneapolis, Minnesota. 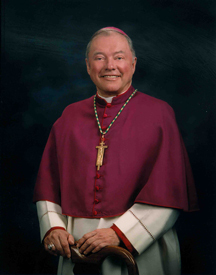 For nine years, he served as Chancellor, Archdiocese of Minneapolis/St. Paul. Bishop Kinney’s previous assignments included: Chaplain, Convent of Good Shepherd, St. Paul; Assistant Pastor, Cathedral of St. Paul, St. Paul; Vicar for Parishes for the Archdiocese of Minneapolis/St. Paul; and Vice Chancellor, Archdiocese of Minneapolis/St. Paul. On November 16, 1976, Pope Paul VI named Bishop Kinney an Auxiliary Bishop of the Archdiocese of St. Paul/Minneapolis and Titular Bishop of Caorle. Archbishop John R. Roach, Archbishop of St. Paul/Minneapolis, ordained him a Bishop on January 25, 1977. Bishop Kinney served as Auxiliary Bishop for the Archdiocese of Minneapolis/St. Paul from 1977 to 1982. On June 28, 1982, Pope John Paul II named Bishop Kinney the Bishop of the Diocese of Bismarck. He was installed on August 23, 1982. On May 9, 1995, Pope John Paul II named Bishop Kinney the 8th Bishop of the Diocese of Saint Cloud. He was installed on July 6, 1995. Bishop Kinney’s retirement was accepted by His Holiness, Pope Francis, upon Bishop Donald Kettler’s Installation.